Heat the oven to 375 degrees. Heat oil in large non-aluminum skillet on medium-high heat. Add the leeks and cook, stirring often, until caramelized, about 15 minutes. Add salt and pepper to taste. Transfer to a large bowl. Meanwhile, heat a large saucepan of salted water to a boil. Stir in the macaroni; cook until slightly soft to the bite, 7 minutes. Drain. Place in bowl with leeks; toss. Add peas and prosciutto; toss. For sauce, melt the 3 tablespoons butter in the large skillet over medium-low heat. Sprinkle the flour over the butter; whisk to mix well. Cook, stirring, until the flour is absorbed and the mixture is bubbling, about 2 minutes. Stir in the milk gradually; heat to a simmer over medium heat. Cook until the white sauce is smooth and thickened, 3-4 minutes. Add the cheeses. Remove from the heat; whisk constantly until the cheese is completely melted. Stir in the mustard, salt and pepper. Pour over the macaroni leek mixture; mix to combine. Place a greased 8-inch-square baking pan on a baking sheet. Transfer the macaroni mixture to the pan. For the topping, combine the breadcrumbs and Parmesan in a small bowl. 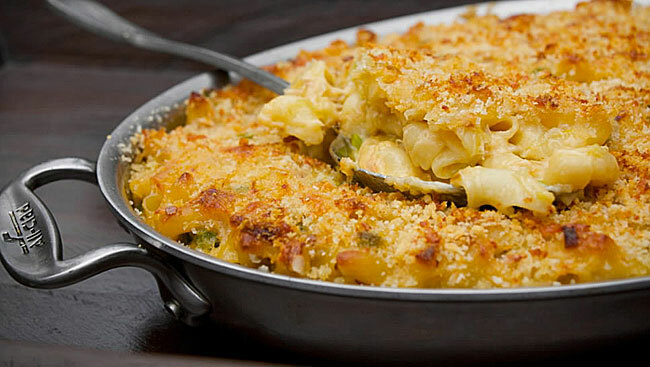 Sprinkle evenly over the macaroni. Dot with the butter; bake uncovered, until the top browns and begins to form a crust, 35-40 minutes. Let cool 10 minutes before serving. This may be made up to two days ahead, covered and refrigerated. Bring to room temperature before reheating in a 350-degree oven for 20 minutes. You may need to cover with foil so it does not burn.